PHOENIX -- Much of the West was smothered in a blanket of heat Saturday with triple-digit temperatures hitting Phoenix, Los Angeles and other cities. Phoenix broke a daily record Friday, reaching 117 degrees, and the expected Saturday high of 116 would top a 1992 record by 4 degrees, National Weather Service meteorologist Dan Leins said. "Stay inside if you can," he said. "It's dangerous, regardless of how acclimated you are to the climate, because it can be deadly." Saturday was Phoenix's 18th day this year with temperatures above 110 degrees, CBSaffiliate KPHO reported. In the desert 50 miles south of Phoenix Saturday afternoon, Maricopa County Sheriff's deputies rescued three migrants who had been out of water for at least three days. Teams were searching for about 17 others who were heading from the Mexican border north. The mercury hit 96 degrees in downtown Los Angeles, with the San Fernando Valley and other inland valleys ranging up to 108. Palm Springs hit 116 and Death Valley's high could reach 120 to 125, according to the weather service. 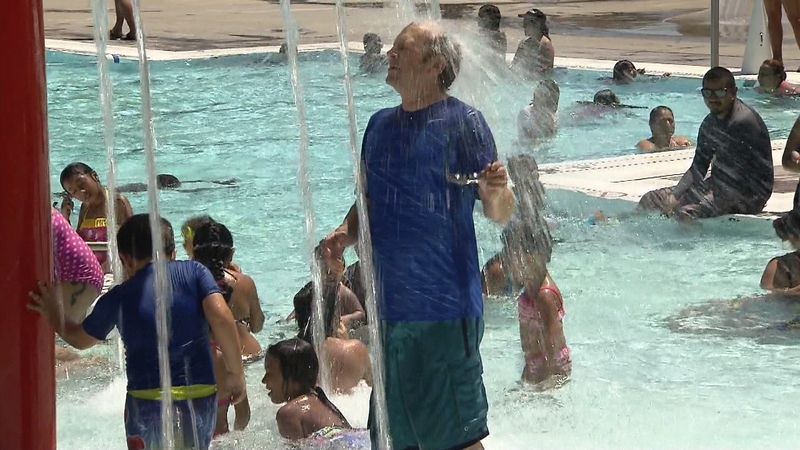 "It's hard for them to be cooped up in the house," Chelcie Skrifvars, an Encino mother who brought her two children to a park splash pad, told CBS Los Angeles. "Finding a splash pad is nice for us." In Moreno Valley east of L.A., a planned power outage was terribly timed for Eddie Cruz and his family. "I thought they could have done a better job planning. I mean, obviously, we all know the weather, how it's going to be, a guesstimate of what it's going to be, so maybe they could have picked a cooler day," Cruz said. The L.A. Department of Water and Power asked customers to be mindful of their energy usage, as the heat wave put enhanced pressure on the power grid. Highs of 110 to 112 were projected for Las Vegas and much of the Mojave Desert. A brushfire that erupted Friday afternoon in forest foothills north and east of Los Angeles quickly grew to four square miles, torched several cabins and remained out of control Saturday. Firefighters worked in triple-digit heat and several were treated for dehydration or heat exhaustion. About one million people were expected to hit 32 miles of Los Angeles County beaches this weekend, county lifeguard Capt. Kenichi Haskett said. Stingrays aren't aggressive but will respond if stepped on. Haskett said people can avoid stings by doing the "stingray shuffle" -- shuffling their feet through the sand when entering the water to give the stingrays warning.